The IoT market is being driven by the desire to make every day’s life simpler and more efficient. This can be very nicely demonstrated by Smart Home applications and more specifically by what is being developed for one of the most important and dynamic rooms of the home: the kitchen. The latter is more and more the room with the highest concentration of connected devices and gadgets, but also the room which most naturally connects with the outside world, besides being the natural monitor and control room of the home. 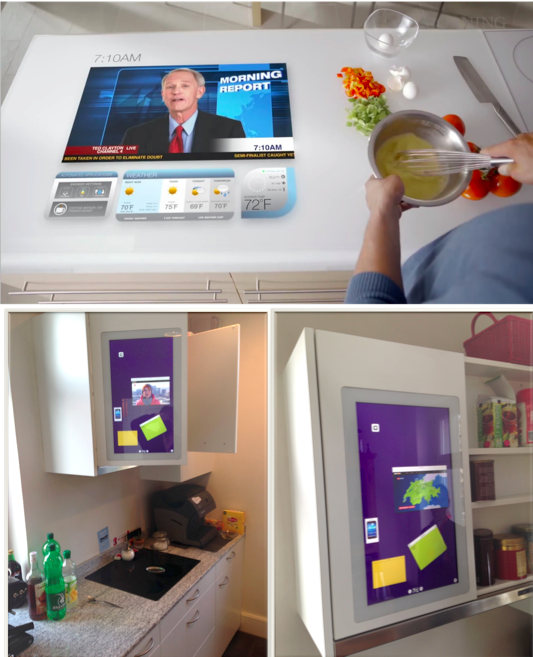 This is why over the last couple of years many startups have jumped on the trend of Smart Kitchen and come out with gadgets such as smart containers for storage level tracking, intelligent ovens that help you to cook at restaurant quality, smart shopping lists so you will never run out of anything again. Other applications integrate wellness devices to determine when and what we cook and eat, while others also enable and optimize energy and waste management, for example. We at dizmo believe that the Smart Home is going from the initial deployment of the last few years, essentially device based, with basically smartphones controlling appliances, to the next level of full services deployment, or Smart Living. The latter requires removal of the silos across systems, allowing them to intercommunicate with each other and with the outer world. Of course this imposes a drastic paradigm shift in how we interface with things and how things interface with each other. Dizmo, the interface of things, enables and supports such new model, by means of its unique capabilities. It is this new model that dizmo pioneers and supports. It is about aggregating services that can be accessed from anywhere, anytime, anyone and on any device. With dizmo we believe that we provide an initial step of many to come towards a new way of living: a Smarter Living.